The truth of the entire matter regarding airborne photo reconnaissance is that there were darn few aircraft built specifically as photo recon planes. Just about everything used was a derivative of a currently produced airframe. It wasn't until the era of the U-2 and SR-71 that there was an actual operational specifically built recon aircraft, and these were high altitude strategic recce, not the 'down on the nape of the earth' tactical reconnaissance. There were many prospects, including the sleek Hughes XF-11 and the Republic XF-12 Rainbow, but nothing came of these. Since fighters were the speed kings, it was natural that these airframes would be the ones modified for the task. With the age of the jet, this tendency continued, first with the RF-80s, then RF-86s and finally with a recce version of the F-84F Thunderstreak. The RF-84F Thunderflash shared a number of common parts with the fighter version. However, the need to house the cameras in the nose of the plane meant a bit of a redesign. Side intakes for the engine were provided, changing the planform of the aircraft and probably slowing it down a tad as well. However, for tactical reconnaissance, it wasn't totally necessary to travel at high mach numbers, though it wasn't a bad thing either! Since NATO had chosen the F-84F as its standard fighter-bomber, it was a logical move to accept the RF-84F for tac recon as well. This allowed commonality in most parts and simplified pilot instruction as well. The RF-84F was a very popular aircraft and soldiered on after the fighter-bomber was retired. The last country to operate the type was Greece which didn't retire the last one until 1989, surely a pretty amazing service life for any jet. This is the first PJ Production kit I've seen. I have heard about them for years and they have been lauded for their completeness and accuracy. I found it a bit odd that there would be a resin kit of one with the Italeri kit easily found for much less, but when I looked at this kit and compared it to an Italeri build I had, I saw that there was quite a difference in the shape and in the level of detail of the PJ Production kit. This is especially true around the cockpit area, which is too broad on the Italeri kit. 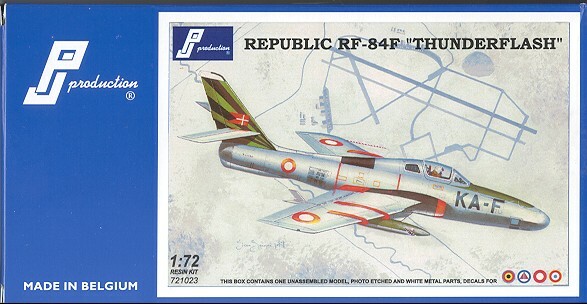 The PJ Production RF-84F includes a lot of parts and a great deal of detail. It is obvious from going over the parts that a lot of thought has been put into the engineering of this kit. For instance, there are positive alignment pins for the fuselage, tabs for the wing and reinforcements for the nose halves as well. The lower nose and forward nose are made out of clear resin. The lower nose section isn't quite a clear as the nose, but a bit of clear gloss should take care of some of that. There are no cameras provided anyway so most will probably paint the inside of the camera windows black anyway. The detail level is very good, though I did find a few air bubbles on some of the thinner parts of the wing and holding the wing and tail planes up to a light source, I could see a few more just under the surface, awaiting the opportunity to spring forward when sandpaper is applied! However, nothing major and those of us who are at the level of building one of these kits will be able to fix it. I also noted when test fitting the fuselage halves that there is some shrinkage around the lower fuselage pour stubs, so some filler will definitely be needed there. The kit includes two clear vacuformed canopies and a very nicely done photo-etch fret. The P.E. includes outer speed brake sections, the wing fences, intake splitters, and some other small bits. There are two different seats included in the kit, though there is no indication of which marking option uses which seat so you'll have to dig through your references to make that determination. No seat harness is included either. 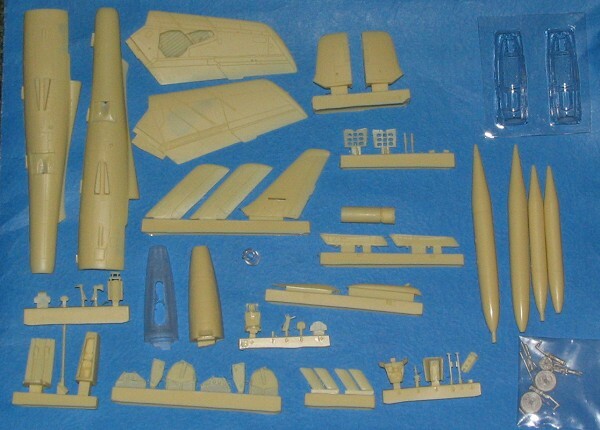 The kit also includes cast metal parts for the landing gear and wheels. This is an excellent idea as it prevents the inevitable 'sag' of resin parts after a period of stress. The castings are very nicely done as well. I should mention that there are bits to allow an open canopy, but the builder will have to cut the one provided in order to use this display method. Another option is the choice between 230 and 450 gallon drop tanks. These are well molded, but I have to say that during shipment, the pour stubs on a couple of mine broke loose and they have flat nose sections. This will need some build up with either epoxy putty or super glue to reform their shape. Overall I should mention that despite a few parts adrift, the kit survived the international mails in good order. The instructions are well done and written in English. They include color information where needed and have well drawn and logical construction steps. Markings are included for four aircraft. One is a SEA camouflaged Belgian version while the other three from Denmark, Norway and France are in unpainted metal. The Danish version shown on the box art is the more colorful of these, though the large unit markings on the French one are also quite nice. In all, four very nice options. The decals are very well printed and look to be of excellent quality. The painting and markings guide are quite well done and show where every stencil and marking go. I have to say that all that praise I had heard about these kits is well deserved. Though it definitely not for the new resin modeler, those who have done several should find this one to be no more difficult that the norm and probably easier than some others! I look forward to giving this one a try in the near future so stay tuned! My thanks to PJ Production for supplying the review kit.